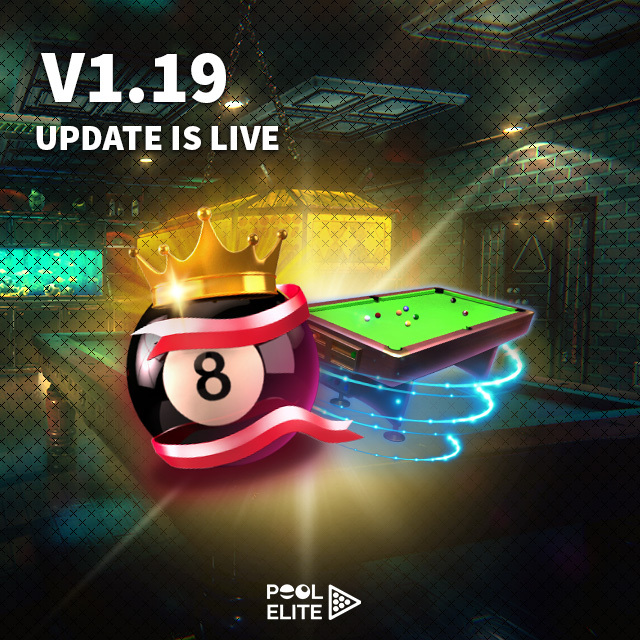 Hello everyone, Pool Elite is live with V1.19 Update. We implemented new UI for better user experience and added new features! ➤ Profile; earned/unearned Trophies, level, ELO, equipment information of you is placed here for quick access. You can also see your statistics in Profile > Statistics menu. ➤ Daily Objectives; you will get 4 new objectives every day to complete in 24 hours. The reward increases with the difficulty of the objective. ➤ Friendly; Friendly menu now has two sub-menus. In Friends menu, you will see your online and offline friends, chat with them or send duel to them. In Hotseat menu; you will be able to play the game on same device by taking turns. Right, it means that you can play the game with your friend without the need of any other device. ➤ Challenges; challenge categories are merged and now you need to complete each challenge step with a high performance to get 3 stars. Collect stars and win prizes! ➤ Mailbox; you will be notified here when you receive a friend request, earn a Trophy, become a champion in tournament, levep-up and so on..
➤ In-game; we used our players’ feedback to improve our game and simplifed in-game UI. ➤ In ranked mode, if your opponent is not your friend, you will only be able to use quick chat and will not see in-game chat screen. Both in-game chat and quick chat are available in friendly matches. There may be some errors and bugs because the change is big but we will make our best to fix them all. Please keep reporting the bugs that you experience.